HAWMC: My Best Doctor’s Visit EVER! It Really Is All In My Head. Today I am using one of the bonus prompts, which is “describe my best doctor’s visit”. This won’t come as a surprise to those who are living with chronic illness, but the day I FINALLY received a diagnosis was, and still is, the best doctor’s visit ever. It took over five years before I had a diagnosis. It was a beautiful fall day. Sunny, warm and the summer’s humidity was long gone. It was so comfortable to be outside. The ENT’s office is only about 5 blocks away and I took a cab to my appointment. Even though the office is close to me, I didn’t want to take a chance on missing the appointment. I can walk very short distances, but some days, walking two blocks is pushing things. The doctor explained that my health issues involved my ears. So many things that couldn’t be explained by the other specialists started falling into place. So many things started making sense. I became my own chronic illness detective by connecting the dots and solving some of my health mysteries. In the way that having a cold leads to not feeling well and then getting cranky, I could make sense of some of the various symptoms of my, until then, mystery illness. A lead to B lead to C. Ears giving me problems, adrenaline goes up, feel very warm even though I didn’t have a temperature. Sudden changes in weather, ear problems amplified, walking two blocks becomes a marathon. When I walked home from the appointment that day (yes, I said walked home because I was that happy to have a diagnosis), I felt like I was floating on air. I was elated! I was euphoric! I smiled from ear-to-ear! I finally had an answer! And that’s what anyone with an unknown chronic illness wants – answers. We all deal with various battles where our chronic illnesses are concerned and so many times we are being reactive instead of proactive. At least, that’s how I felt and still feel most days. Although the doctor couldn’t tell me the specific diagnosis and reason why my ears were giving me problems (he said it is common with vestibular problems to not know the cause), I had a diagnosis from a specialist that, yes, something is physically wrong with me. It wasn’t psychological – “in my head” – the overused diagnosis doctors give when they don’t know what is happening with you and you don’t present with symptoms that can easily lead to a diagnosis. This, wrongly, continues to happen to so many of us. In the end, ironically, my best doctor’s visit ever confirmed that yes, not only is something physically wrong with me, (and since the ears are in the head) it really is all in my head. Welcome to the first prompt of the Health Activist Writer’s Month Challenge by WEGO Health for April 2012. Today’s prompt asks what would we put in a time capsule, to be opened in 2112, that focuses on me and my health and what might people think of the contents. any illness characterized by signs and symptoms of rapid onset and short duration. It may be severe and impair normal functioning. any disorder that persists over a long period and affects physical, emotional, intellectual, vocational, social, or spiritual functioning. The Ear, Nose and Throat doctor could not give me a specific diagnosis but was able to confirm that something was wrong with me physically. Ask people who have an invisible chronic illness and there’s a decent chance that someone they have seen in the medical profession decided that the illness is psychologically-based. I have issues with disequilibrium, a feeling of being off-balance. I very rarely get close to a vertigo attack but I owe that to the fact that I will, for example, sit at my computer and read the newspaper, catch up on emails and visit various sites while I have my breakfast. When I’m done, I lie down so that I give my ears a rest. Not my arms, legs or other body parts but my ears. And I have to do this throughout the day. If I don’t, the disequilibrium gets worse and worse to the point that I lose my balance and start to fall to the side. Because of this, I can’t work so I’m on disability because of my ears. When I first became sick, I used the analogy of being on a boat and bobbing along the water as a way to describe how it felt inside my head. I chose some pictures and videos for my time capsule and a short description on how they show what it is I’m feeling in my head as I go through my day. I’m not going to try and guess what the people of the year 2112 may think of the contents of my time capsule. What I hope to accomplish with the pictures and videos is to help bring some understanding and awareness to how I and others feel on a daily basis. 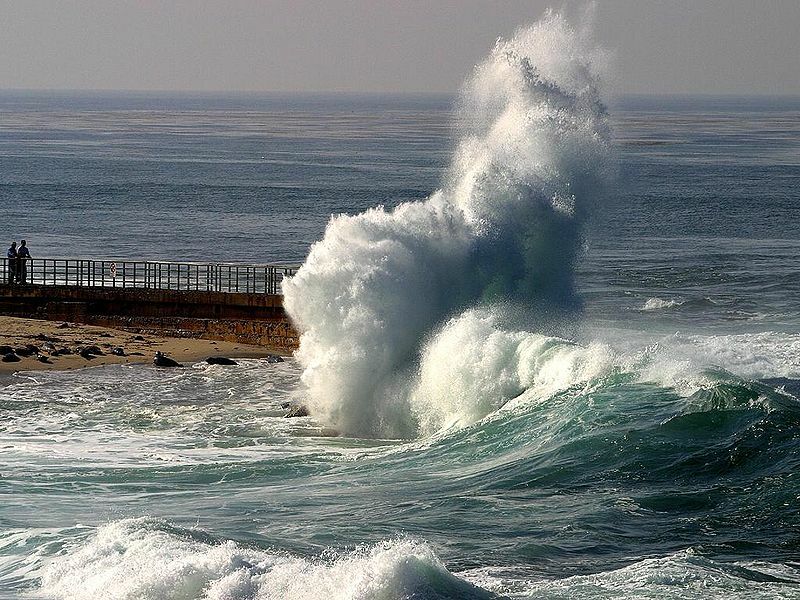 I looked at this wonderful picture and immediately saw my ear monster in the wave on the right. He’s checking out what’s happening, his hands on the wall ready to propel him into action. Each day offers a new way to shake things up for me. Each day, I am affected. I chose these videos because I think this best represents how it feels inside my head. Imagine you’re on a boat, no oars to help paddle. No way to gain control of the boat to get to the firmness and stability of the shore. You are at the mercy of the waves. Some days I feel like I’m in a small boat with lots of motion, other days I feel like I’m in a larger boat but with less motion. I still feel movement, but the size of the boat helps determine how much motion I feel. On my good days, I will feel small ripples. There’s not too much motion, but enough to let me know the monster is always there. Some days I have no control over my ears. A cold, allergies, using too many of my spoons (read The Spoon Theory if you don’t know what I mean) or changes in the weather produces a constant motion in my head, even before I get out of bed. Sometimes I’m sitting still, reading or watching tv and I am not physically moving, but inside my head it feels like a wave has slammed into me, shoving me from my spot and I’m falling over. But again, I’m sitting still. On good days, I feel a bit of movement in my head, but not that much and I’m able to be a little bit active. Go for a walk, get a few groceries, the things I used to take for granted before I got sick. This is Mirror Lake in China. I chose this picture because for a short time each day, the water seems almost still. On rare days, I get very lucky. All is calm with my world. I never know when those days will happen. I take them when I can and enjoy them. However, we know that no matter how calm things appear on the surface, there is always movement underneath. And some days, it is overwhelming and I spend a lot of the day in bed. Each day, as I’m waking up, I feel like the person in the picture below, looking, searching for clues as to how my day will be and how my ears and the ear monster will be treating me that day. Today’s NHBPM post is a letter to my 18 year old self. I’m writing this letter so that you can better prepare for what may happen to you later in life. I know as an 18 year old you may not understand everything I will tell you, and that’s OK. I am being vague in some cases because I don’t want you to live in fear as to what may happen. Because it happened to me doesn’t mean it will happen to you. What I do want, is to help you make better choices. I know what you’re thinking right now. You planned to take a year off and work, save money and go back to school. If it’s not happening now, you will soon want to move out on your own. I loved it but I didn’t go back to school. Allow me to offer an alternative plan. I realized that I can listen to people and hone in on the problem and I enjoy being able to do that. My suggestion is to go to university in another city so that you can live away from home and take psychology or you may find something completely different that you like. I think you will be happy doing it that way. You can live away from home and you’re still going to school. You will have so many more doors open for you and I’m sure you will also grow into a more well-rounded person much earlier than what it took me. You also have to understand that mom and dad, while having your best interests at heart, will say and do things that are based on their personal fears. Don’t let this affect you and your fears. They only knew what they have been taught by their parents. Also know that mom will be battling depression. The phrase, “Mom being mom” will be used to describe how she behaves. But remember, it will be due to depression, her thinking back on lost opportunities and opportunities that women of her day didn’t do. Also remember, mental illness wasn’t really talked about when I was your age. It’s being talked about more openly now but is still viewed with fear by many people. Also, open yourself up to opportunities and be more social. Meet a variety of people. I really enjoy knowing where people are from and listening to their stories. I was such a homebody. Learn different arts and crafts. Take continuing education courses. You like variety. You may not stick with one thing but you will have fun learning. Make sure you stay in shape. Exercise and eat healthy meals. DON’T do fad diets. This will help you so much later on you can’t even begin to realize it. The reason I tell you these things is that you may be hit with a chronic illness. Remember how mom had Meniere’s? I have ended up with a vestibular disorder as well but the doctors don’t know what I have exactly so they are unable to offer much in the way of treatment. I’m not able to work any more and having balance issues and mobility issues are affecting other areas of my health such as muscle strength and endurance. I am worrying about heart disease at a younger age than what I should. That is why I’m tell you to get and stay in shape NOW. I will tell you that the trigger is a really bad flu. The virus itself was bad and many people were sick. At one point, close to 1/4 of the people I worked with were home sick with this flu. I suspect the vestibular disorder may be genetic (two immediate family members having a similar disorder?). I have been told by different doctors that it is a co-incidence but I don’t believe them. Doctors are very hesitant to say genetics play a part. 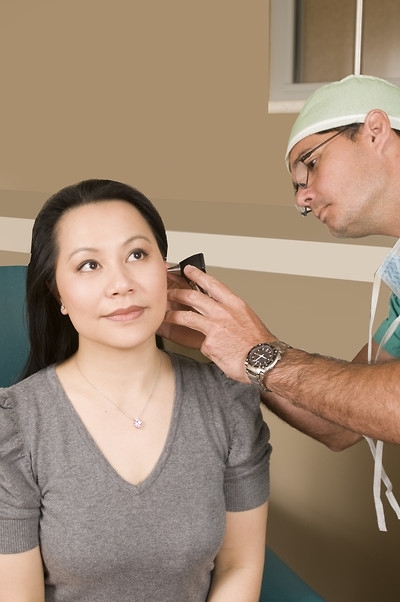 There is very little in the way of help and research of inner ear disorders so there are huge stumbling blocks for all involved. Again, I don’t want to say too much about MY illness and don’t want to scare you. I believe in my heart that MY illness may not become YOUR illness if you take care of yourself and stay healthy. You will feel better and probably get less colds and flues. What I do want is for you to take more chances, love more freely, be healthy, go to school, make friends with a wild variety of people and have confidence in yourself. It’s been there all along. Just open yourself up to new possibilities. In closing, I want you to remember that you have a kind heart and a good soul. Don’t let others tell you any different. There are many people who are ruled by fear, ignorance and misunderstanding. But you do need to prepare for a possible health crisis. I truly, truly believe that if I was healthier I may not be having the problems I’m having now. I wish for you a lifetime of wonderful adventures and opportunities. Here’s some articles and interviews that I’ve read and heard recently and I wanted to share them with you. While some of the links deal specifically with vestibular disorders, anyone living with a chronic illness can relate to the information that is being shared. Marissa Christina is the guest on The Big Web Show. It is an audio interview where she talks to the hosts about living with a vestibular disorder and the hurdles she is facing while living on disability and trying to become a web designer. She also wrote about it on her blog called Abledis.com where you will also find the link to the interview. Many of you know Lisa Copen as the founder of Rest Ministries and National Invisible Chronic illness Awareness Week. Lisa has written an article called 5 Tools to Cope With Invisible Illness to “help let go of some of the frustrations” of having an invisible chronic illness. Those of us with chronic illnesses know that weather can affect not only how we feel but our health. These articles from CBS MoneyWatch.com and The Weather Network help explain how weather contributes to migraines, pain and loss of concentration. Vestibular Disorders Association (VEDA) has an article called Observations on Cognitive and Psychological Aspects of Vestibular Disorder. It is excerpts from interviews with a social worker, an otolaryngologist and a neuropsychologist. While it deals with how vestibular disorders affect people psychologically, I believe that anyone with a chronic illness can see themselves in the article.